Excellent water polisher suitable for all pool and spa applications. Pura Blue is composed of Chitosan. By reducing the level of body fats and oils, it actually enhances sanitiser activity. 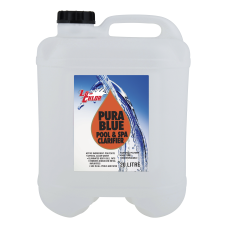 Enhances filtration cycle, increasing time interval between backwash cycles. Can be used with all known pool and spa treatments. Chitosan is derived from crushed crab and prawn shells. It is a truly natural polymer. Safe to use where fish are present. Unlike conventional floccing agents, this product does not deposit suspended matter on the floor of the pool. Suspended matter is filtered from the pool and it accumulates on the filter pads or filter media. This matter is removed when the filter is backwashed. 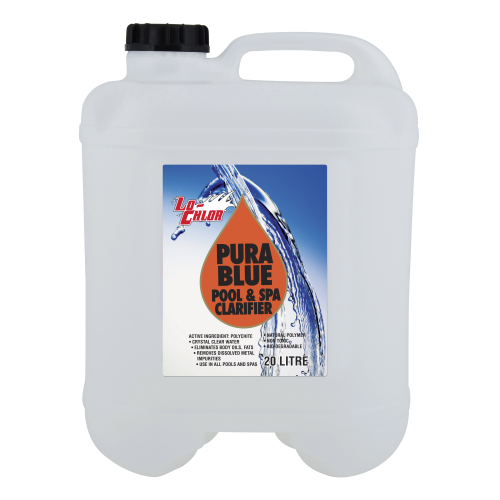 • The active constituent in Pura Blue (Chitosan) was originally used by the U.S. Navy to clear seawater for underwater photography.